Saturday night in Las Vegas used to mean rhinestones and feathers on the Strip, but, just like the Stardust itself, the days of sparkling lovelies in enormous headdresses are gone. Luckily for those who miss those glitzy shows, impresario Rich Rizzo is still around. 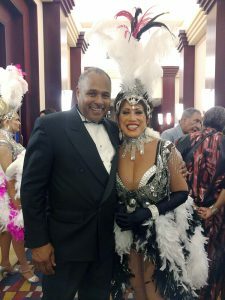 He choreographed “Lido de Paris” at the Stardust and “Jubilee!” at Bally’s. Those glamorous revues are now forever dark, but that hasn’t stopped Rizzo. 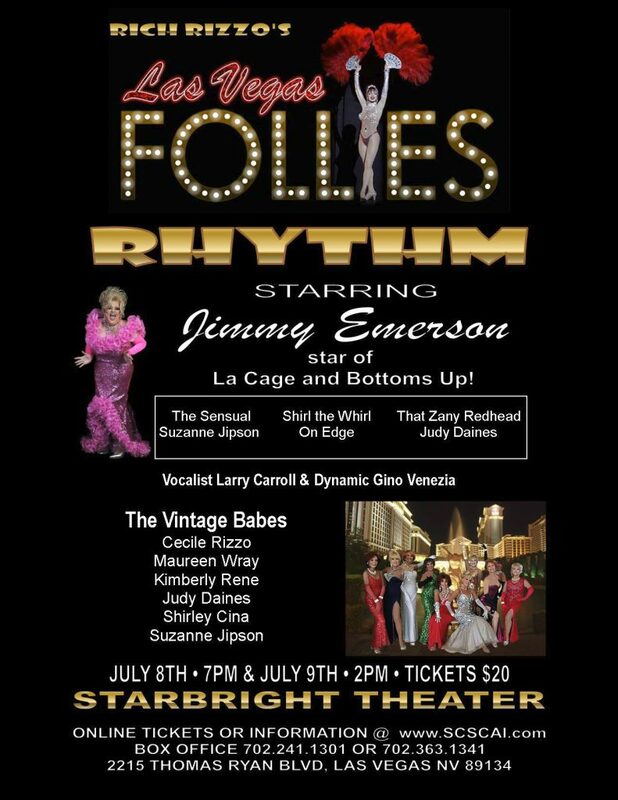 Saturday night, I took in “Rhythm,” the latest production of Rizzo’s “Las Vegas Follies” at the Starbright Theatre in Summerlin. A variety show featuring dancers who once performed up and down the Strip in extravaganzas like “Les Folies Bergere” at the Tropicana and “Splash” at the Riviera, “Rhythm” delivered the same punch as those productions of yore. Sure, those other shows had bigger budgets and longer runs, but this one (two shows only!) had all the same talent energized with the heart and soul of performers who love their art and are on stage for the pure joy of sharing it with an appreciative audience. The Follies cast included Rich Rizzo, impersonator and drag queen Jimmy Emerson, formerly of “La Cage,” actor/newscaster/singer Larry Carroll, and dancers Gino Venezia, Judy Daines, Cecile Rizzo, Maureen Wray, and Kimberly Renee. Rizzo wowed with a tap dance, and Carroll carried the theme with lovely rendition of songs including “Birth of the Blues.” Emerson emerged as a different flamboyant person after every number, possibly delighting the audience most as an extremely well-endowed Nancy Sinatra with boots clearly made for more than just walking. Stealing every scene she was in, Shirley “Shirl the Whirl” Cina danced sang, and had the audience roaring with her comedy routine. The Follies have been around for nearly a decade now, which means there’s a good chance they’ll be back next year with another retro production. Keep an eye out. From Rizzo’s tap shoes to Shirl the Whirl’s feather bustle, they are proof that vintage Vegas is not only alive, but singing, dancing, and telling jokes. This is awesome! Thank you so much for your incredible writing. Everyone at the Follies so appreciates your attendance and looks forward to performing for you again.